NASA's Earth Science Data and Information System (ESDIS) Metrics System (EMS) collects information from all ingest, archive and distribution interfaces throughout EOSDIS and analyzes data on the use of products and services stored in databases or delivered via the Internet. Specifically, EMS collects and organizes various data file metrics from Earth Observation System Data and Information System (EOSDIS) Data Providers. The metrics data and the analysis reports generated from EMS provides NASA managers the information needed to determine how to best apply resources to support the science community. 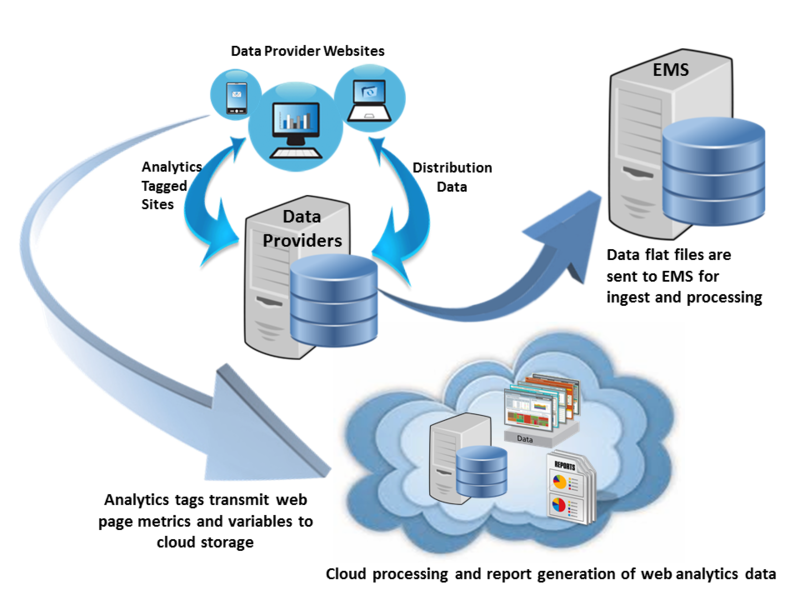 The EMS web metrics component is a cloud solution web analytics service that collects, tracks, and reports on EOSDIS Data Provider website traffic. Successfully used, enterprise analytics support key design and development decisions and helps create relevant customer experiences. Traditionally web analytics are considered the analysis of data captured on a website: click-throughs, page views, path analysis, recency & frequency, etc. EMS replaced the traditional IBM NetInsight web analytics program in 2017 with the digital analytics product Google Analytics 360. How are EMS and Web Analytics Used? Data Providers supply data files with information on archive, ingest, distribution, special services, offline ordering, media distribution, and other non-web activities to EMS. EMS files are then processed into the EMS Oracle database, resulting in the creation of archive, ingest, and distribution metrics and reports. EMS provides the users with access to the data file metrics, reports, and errors via the APEX/HTMLDB web interface that queries the EMS Oracle database. In addition to EMS’s HTMLDB/APEX datafile user interface, EMS supports 2 types of digital analytics interfaces to report on Data Provider website usage metrics. HTMLDB/APEX is used to report on Data Provider Earth science satellite data processing, archiving, and distribution. The digital analytics interfaces are used to report on the data information, services, and handling tools on Data Providers web sites. Thus, digital analytics products collect usage information on Earth science web data and interfaces used to view imagery and order and download the data products. The primary digital analytics reporting interface, Google Analytics 360, permits users access to their website’s metrics data, for the purpose of generating reports on all key web metrics. These reports help in understanding the website and application visitor needs, and to better evaluate the performance of the website’s content, products, and more. Crazy Egg, a second website analytics tool, helps better understand a customers’ behavior on a given web page and provides insight on how page features and content are being used. This information, in turn, aids in optimizing page design for a better visitor experience. How do you get Access to EMS and the Web Analytics Tools? Note: Google Analytics 360 is still in the setup and testing phase. Contact Earthdata Support for questions, comments or technical issues.